Here, Interpol remind us that dressing well and the rocking hard are not mutually exclusive skills. April 8--Real Estate (Club Dada, Dallas): Annoyingly young (Makes me feel like I've done nothing). Beach-drenched guitars hum just as sweetly live. April 19--The National (Cain's Ballroom, Tulsa): Great. Just not quite as great as Dallas. Still great. 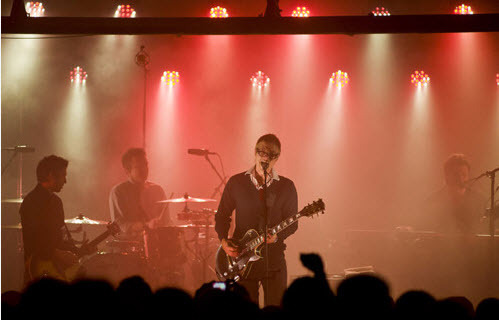 April 20--Interpol (Cain's Ballroom, Tulsa): Raw. Clinical. Dark. Power. Exceeded all expectations. Best show of 2011 thus far. April 30--Ty Segall (Norman Music Festival): Rock noise with skill and hooks. Fun as hell. April 30--Peelander-Z (Norman Music Festival): I am insane now. April 30--Black Joe Lewis & The Honeybears (Norman Music Festival): Rock. Soul. Belly dancers. April 30--The Walkmen (Norman Music Festival): Proof that even the best of shows can be almost ruined by teenage hipster douchery. Free festivals may just not work. 2. I have a new term I'd like to unveil for certain bands/artists that succinctly makes an otherwise layered argument--"E.N.C." E.N.C. : Label attached to a band/artist with an artificially-inflated reputation fueled by trendy, hipster-hyped groupthink, a la the moral of The Emperor's New Clothes. Here, I'll use it in a sentence: "Sorry Jake, but no one actually thinks Panda Bear makes good music--he's just a complete and utter E.N.C.". Recent examples of this include, but are not limited to: Tyler the Creator. James Blake. Discuss. I anxiously await your outrage. Kaputt by Destroyer: Lyrics of abstraction combined with beats of attraction. This is about the smoothest album you'll hear in these current times. As in silky smooth vocals and heavenly smooth harmonies--and did someone steal Sade's sax player for this album?? Did I mention smooth? Actor-Caster by Generationals: Less "dance-y" but no less catchy derivative of MGMT in many ways. One of the surprise treats of 2011 so far and a real contender for album of the year-type honors from your favorite music blogger. Or maybe even me. Helplessness Blues by Fleet Foxes: I was ready to be disappointed with this sophomore effort, but this band just makes beautiful, choral-centric music that satisfies and pleases. It's obvious that a lot of work and skill goes in to making this music, but the execution of it sounds anything but complex. Liking this album is an effortless venture. E.N.C huh? That translates into "not dad-rock enough for Rob." I can however get on board with all three of weekly albums. And, I think you should ignore the James Blake hype and give his self-titled another listen. It's really good music.